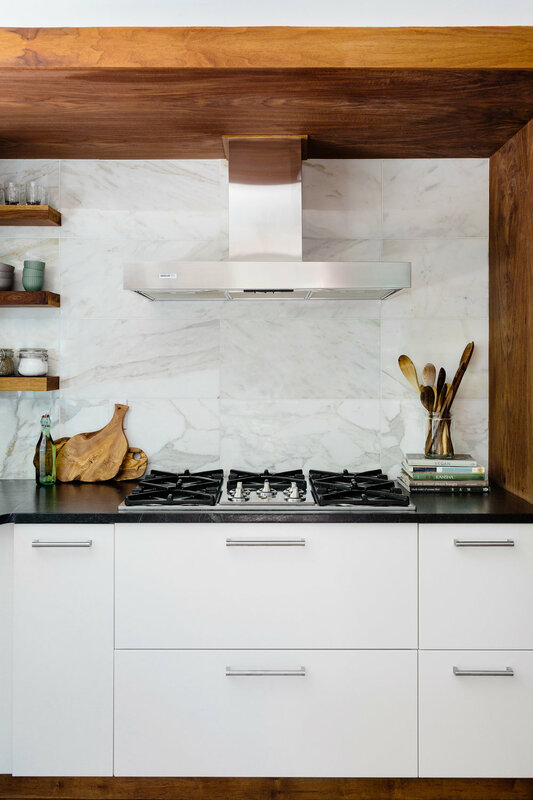 Our clients Nisha and Ian are avid cooks, and they dreamt of a kitchen which could accommodate an active family and flow while entertaining large groups. We redesigned the layout to create a 9’ butcher block live edge walnut island which became the locus of the home. The storage was designed meticulously using Ikea Cabinets to accomodate Nisha’s list of equipment, cookbooks and crockery. They were very excited about using natural materials like Soapstone, Wood and Marble which gave us a great jumping off point for the materiality. The artwork and accents are reflective of their own creativity and reminiscent of their Southern heritage. The backyard was a lush mature garden that Nisha and Ian had spent a considerable amount of time working on and perfecting. We wanted to make sure that it was clearly visible from the kitchen by adding a set of sliding windows to the back and sliding doors to the side deck. The window enables them to pass food to the sitting area and Jacuzzi on the patio.